Trying out new things in Louisville is one of my favorite things to do. I love this city and have adopted it as my own. This is one of the reasons I absolutely love helping people find their home here in this wonderful city. One of my newest fascinations is Louisville’s food trucks. A brilliant idea! Food on wheels! 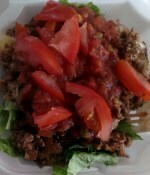 I’m always pleasantly surprised at how great the food tastes. One of those happy surprises is the food truck Genius In A Box. My husband and I were checking out Jeffersontown’s Gaslight Festival when I felt drawn to this creative truck. I ordered the sandwich The Genius (I’m a sucker for anything that has ham and sautéed onions!) and it melted in my mouth. The sandwich was big enough to feed me and my husband. The food was enough to make me want to come back, but as a bonus I was fortunate enough to get to talk with the owners, Tristian and Diedrea Barnes. 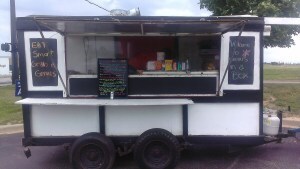 They were both incredibly friendly and patient enough to answer all of my questions about the business of food trucks. When you see this truck driving around, make sure you stop and say hi from the At Home In Louisville Real Estate Group! “Genius In A Box was created from matrimony. We took our savings from our wedding and started this business. We thought, ‘what better way to share our love, then by giving Genius to those who love great food.’ Even though I'm the Chef and my wife's the smile, the taste of Genius comes from unified effort-flavors each dish with a sprinkle love." For more information about other great places to eat in Louisville or to learn about Louisville Real Estate, contact At Home In Louisville Real Estate Group today. 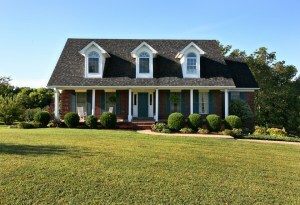 415 Oak Ridge Dr Taylorsville KY 40071 is a picturesque 3 Bedroom home on a quiet cul-de-sac in Hillsboro Estates. The welcoming front porch leads to a foyer with glistening hardwood floor and neutral decor. The Great Room also showcases hardwood flooring as well as a brick fireplace and vaulted ceiling. The home has a wonderful Kitchen with granite counter tops, modern appliances, abundant cabinet space, breakfast bar, and spacious dining area. The first floor Master Bedroom is accented by a tray ceiling and has its own separate sitting room. The Master Bath includes a huge walk in closet, shower, and jacuzzi tub. The first floor also includes a Laundry and Half Bath. Two pleasant secondary bedrooms and a Full Bath are positioned on the second floor. One bedroom has its own sitting room and a pretty window seat. The Walk-Out Basement has been finished with a comfortable Family Room. The basement utility room provides great storage space. 415 Oak Ridge Dr Taylorsville KY 40071 has a beautiful back yard with mature landscaping and a large deck with patio below. There is a two car attached garage and recent updates include a new water heater, furnace, and AC in 2012 and roof work to be completed in the fall of 2013! Call today and let one of our Realtors in Louisville KY give you a private tour! 76 Webb Ln Taylorsville KY 40071 is a move in ready 3 Bedroom home on slightly over an acre lot in the Watkins Glen subdivision of Tayorsville, KY. The front entry opens to a spacious Great Room with wiring for surround sound and neutral decor. 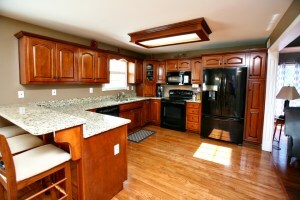 The pleasant Kitchen offers abundant counter space and a dining area with lots of natural light. The large Master Bedroom has a private Master Bath and a wonderful walk-in closet. The first floor also includes two secondary bedrooms, a Laundry Room, and Full Bath. 76 Webb Ln Taylorsville KY 40071 has a partially finished basement with a Full Bath and a huge area for storage or future expansion. The property is positioned in a fantastic location with easy access to expressways. A few recent updates include new gutters, siding, and roof in 2012! The back yard and deck are the perfect spot to enjoy the sunrise or entertain guests during the summer months. Serenity and spacious interior! Call one of our team members today for further information about this property and homes for sale in Taylorsville KY.
810 Skyline Drive Taylorsville KY 40071 is a beautiful walk out brick ranch in the Views of Elk Creek subdivision. The home includes 4 bedrooms, 3 1/2 baths, and a 2 car attached garage with a large circular drive. A gorgeous glass door entry with palladium window greets guests and leads to a pleasant Foyer. 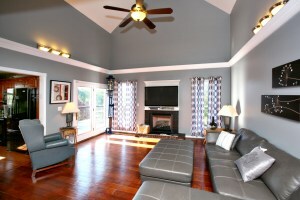 The Great Room is lovely with a gas fireplace, vaulted ceiling, and sparkling hardwood floor. The Formal Dining Room is columned with hardwood flooring and lots of natural light. The Eat In Kitchen showcases granite counters, stainless appliances, custom cabinetry, breakfast bar, & spacious dining area. A split floor plan gives privacy to the bedroom areas. The Master Suite is accented by a tray ceiling and contains a luxurious Master Bath with double vanity, shower, & tub. The Master Suite also includes his and hers walk-in closets and attractive french doors to the deck. Two more good sized Bedrooms, a Full Bath, Half Bath, and Laundry complete the main level. 810 Skyline Drive Taylorsville KY 40071 has a fully finished walk-out Basement. The Basement Family Room showcases a second fireplace, abundant natural light, and 9' ceilings. A Full Bath, additional Bedroom, and Den complete the Basement. The back yard is relaxing and perfect for entertaining with a screened porch and lower patio with hot tub. The home sits on slightly over an acre of land with mature trees. There is fantastic storage space with a utility room to store lawn equipment. The property has been meticulously maintained with recent updates including hardwood flooring in the family room and dining room, granite counters and stainless appliances in the kitchen, new carpet (July 2013), gutters (2012), and roof (2011). The current owners also added the screened porch in 2009. Simply beautiful home! Call today to set up your private showing and let our team give you an overview of the homes for sale in Taylorsville, KY.